This tutorial will tell how to increase the size of C drive system partition on Windows 2000/2003/2008/2012 with IM-Magic Partition Resizer Server. Download IM-Magic Partition Resizer Server to extend system partition C drive on Windows Server operating system. It is risk-free and easy-to-use. After installing IM-Magic Partition Resizer Server on your computer, you can use it to extend system partition C drive when you need help because C drive is running out of disk space, C drive is too small, there is no space on C drive, etc. This partition software enables you to extend system partition on all Windows Servers including Windows 2000, 2003, 2008, 2018, SBS 2003, SBS 2008, Windows Server 2003 R2, Windows Server 2008 R2, Windows Server 2012 R2, etc. IM-Magic Partition Resizer Server is 100% risk-free and easy-to-use partition software which is worthy of your trust. Download, install and run IM-Magic Partition Resizer Server. 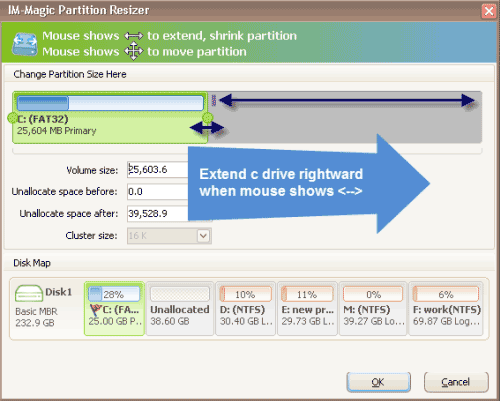 Right click a partition and choose "Resize/Move" option. Move the arrow to squeeze some unallocated space by shrinking the selected partition. Then, you need to move the unallocated space close to system partition. Right click system partition and choose "Resize/Move" option. Move the arrow to extend system partition and then click "Apply" button. Why Extend System Partition C Drive Windows Server? All partitions have been allocated with certain space randomly or carefully when building in Windows Server. The total size of each partition will not change unless you repartition or resize the hard disk, but the free space on a partition will become less and less along with the increasing used space. You may think to move some files to other partitions, but how much space can you free by moving files? You may think to format the partition to free disk space, but you may find that you are unable to format a system partition? You may think to reinstall system to format system partition, but can you afford to lose everything stored on this partition? It seems like that there is no good solution when system partition is lacking of disk space, but the truth is that you can extend system partition on Windows Server without moving data, reformatting disk or reinstalling system. From the steps above, you know may know that unallocated space is needed in order to extend system partition, so you always need to shrink partition if there is no unallocated space. Usually, you can shrink any partition on the same hard disk to squeeze some unallocated space, but it is often recommended you to shrink a partition that has large free disk space. The reason why we advise you to do so is to avoid insufficient space on the partition after shrinking. For example, there are C drive, D drive and E drive on your Windows Server. 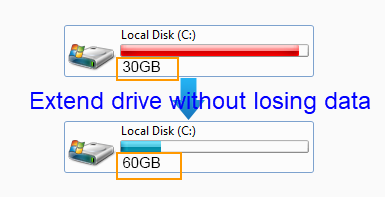 If D drive has 50GB free space while E drive still has 100GB free space, it is better to shrink E drive to squeeze some unallocated space. If you shrink D drive, the free space on D drive might be insufficient when you want to save a large amount of data. PS: If there is unallocated space on the same hard disk, you can add the unallocated space to C drive without shrinking any partition. Question about Windows Server 2003 system partition extending is quite frequently asked by people because Server 2003 appeals to lots of computer users. IM-Magic Partition Resizer Server is able to extend system partition on Windows Server 2003, resize C drive on Windows 2003 and fix low disk space problem on Server 2003. This partition software can also extend system partition on Windows Server 2003 VMware effectively and efficiently. No matter you extend system partition on a physical computer or in virtual machine, IM-Magic Partition Resizer Server will not have any influence on the operating system or disk data.